Urke, has been the owner of his own successful excavation and septic installation business since the mid 1970’s and suggested his son start a complementary septic pumping business to serve the local communities. 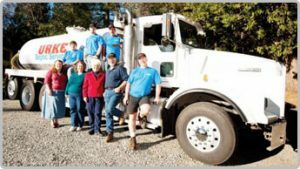 Doug and his employees have built a reliable, dynamic septic and sewer business making the Urke name synonymous with honest, affordable, professional septic and sewer services. For over a decade, Urke Septic and Sewer has been serving our valued customers in Grass Valley and the surrounding areas. In that time, our fully licensed and insured technicians have built our reputation for exceptional results, and impeccable customer service, one client at a time. Our locally owned and operated company continues the tradition of providing a broad range of septic and sewer solutions for homeowners, real estate professionals and businesses. We invite all our potential and returning customers to contact us for a free estimate and let Urke Septic and Sewer’s talents begin to work for you.